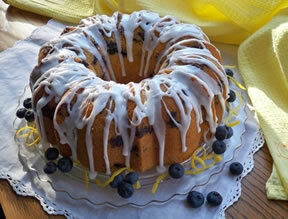 Pretty for show and delicious to eat, this Bundt cake is perfect for your spring celebrations. Grease the entire inside of the Bundt cake pan; then dust evenly with the bread crumbs. In a large mixing bowl, beat the sugar and butter until light and fluffy. You may have to beat for 3 or 4 minutes. Add the eggs one at a time. Beat each one in well before adding the next. Lightly spoon the flour into the measuring cup and combine it with the baking powder, baking soda, salt, and poppy seeds in a separate bowl. Gently whisk these ingredients together. Add the blueberries in with the flour mixture; stir to coat blueberries. 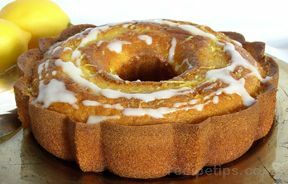 In another bowl, combine the buttermilk, lemon juice, vanilla, and lemon extract in a separate bowl. Starting with the flour mixture, add about a third to the creamed sugar and butter, alternating with half the buttermilk mixture and ending with the flour mixture. When all ingredients have be combined, pour into the prepared cake pan. Bake in preheated oven for 40 to 45 minutes or until a toothpick inserted comes out clean. Do not over bake. Remove from the oven and cool for 10 minutes on a wire rack. Remove the cake from the pan. Allow to cool on the rack. 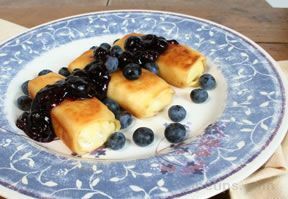 Prepare the glaze by combining all the ingredients and whisking together. Drizzle glaze over the cake when it is still warm. Allow the cake to cool before cutting. "I thought this looked like a lot of work to make but it wasn't. 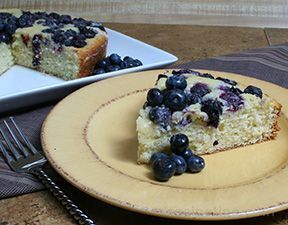 The blueberries and lemon were a nice flavor combination and the cake turned out so pretty. I can't wait to have a special occasion to make this for. It makes a nice spring dessert."